We left early this morning and drove over to Rice Village. It is close to Rice University here in Houston and is only a few miles from our camp. The village is a shopping area and we browsed through the area and did some window shopping. It was 9:30 and nothing opened till 10 a.m., so we just got our exercise. There really wasn't much of anything that interested us, although they had most every kind of ethic restaurant you could imagine. We had already eaten breakfast and it is quite difficult to eat at a restaurant when you have to eat low-salt, low-fat. After making the rounds of a couple of the blocks of shops, we got back in the car and took off to explore some more. We had wanted to explore downtown Houston and today was a great day to do that. Traffic was light and it was warm but overcast. It was rather eerie downtown because the skyscrapers were lost at the top in the fog. It was pretty cool, really. We drove up and down Main Street which has one lane in each direction and two lanes in the middle for the rail to travel both directions. We did find the historic district, which does not appear to be very large. I think much of what used to be "historic" was probably torn down to make way for the high rises. The buildings are awesome, though, and it appears you are looking down canyons with the tall buildings rising up each side of the street. I have put up lots of pictures of the downtown for you to enjoy. We long ago decided that while being in Houston for medical reasons is not how we would like to spend our time, we intend to make the best of it. Houston is an exciting town with lots of activities, museums, arts, shopping, dining, etc., and we intend to spend time exploring. Today Terry wanted to go check out the Speedco on the other side of town. His thought was that during some "down" time, we could take the motorhome over there for an oil change. But when we got there, he talked with the fellow in charge and it became apparent they weren't too thrilled about doing a motorhome. When Terry asked about putting something down on the cream colored carpet, the guy didn't understand why they would need to be in the bedroom. Hmmmm. Have you ever changed the oil in a diesel pusher? He said he was not aware of any fuel filter that was accessible from there. Hmmmm. And the lady there confirmed that they didn't have any paper to put on the floor to protect the carpet. Well, thanks but no thanks. So, that settled, we headed down to Baytown to see what it was like. Didn't find too much there that interested us except for this really neat bridge, but we continued on down through Laporte and ended up at the town of Kemah. There is a boardwalk there which is quite nice. It runs along the channel and the waterfront with shops and restaurants and carnival rides for the kids. There weren't many people there today and very few kids, so we were able to stroll at our leisure and it was quite pleasant. The weather was warm, not hot, and windy because of the waterfront. Very nice for walking outside without even a jacket. Before we headed back to the campground, we stopped to eat at T-Bone Tom's. It was featured on the TV show "Diners, Drive-ins, and Dives." It was an interesting place. The service wasn't so good, but the food was hot and delicious. The portions were way too big for us, so we brought home about half the food and will get several meals off of it. Terry ordered the seafood stuffed jalepenos. We were expecting a small appetizer as they usually are and instead they brought out four on a plate. They were the size of baseballs. We cut one in half and ate that and brought the other three home. No way could we eat more than that! It was an interesting place and the food all looked good. But a lot of it was fried and I cannot eat too much of that as it will make me sick. On the way home, we took the road that went past the Johnson Space Center. That will be one of our trips while we are here in Houston. I think that would be very interesting. When we got back, we had a double treat in store for us. Macy, the golden retriever, was out with her master. We had met them when we were here earlier in December. She remembered us. Terry told her owner we would dog-sit if he needed someone in a pinch. 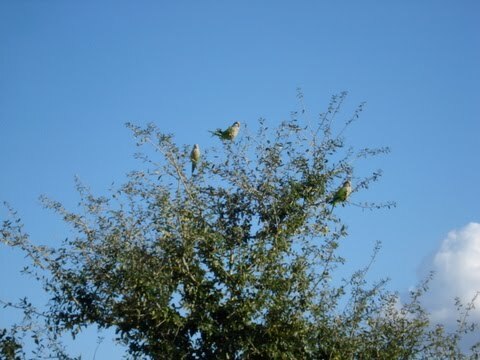 While we were outside talking, the parrots made a rather noisy entrance to our lane. They are beautiful and I know their distinctive tweet now. It's much like a parakeet only louder and huskier, but much different than the "noise" the grackels make. The rains have moved out for the weekend and it is 76* outside with a breeze. It is overcast with the sun occasionally peaking through. Just perfect. A change in weather. . . It's been a long time since we have seen rain. But it started this morning here in Houston and it has not stopped yet. It has literally poured down all day. The lake here at the camp is filling up, but we are not on the lake, so no worries there. The canal between here and town is filling up. We were over it twice today and saw a definite rise in the level the second time through. Along with the rain we are getting thunder and lightning. There is no severe weather forecast and tomorrow promises to be "partly cloudy" with no rain. But since it is so wet out there today, we are going to stay put tonight. Terry did have an appointment today and we went early and walked inside the medical complex to get our exercise. His next appointment is for a procedure next Friday. After that we believe his treatment regimen will start. Both satellites (TV and internet) have been fading in and out all day due to the overcast skies. We will probably pop in a movie or two to watch tonight. We are back at the LakeView RV Resort in Houston and the parrots are here! You may remember that we saw a few the last time we were here. Back then, the fellow next to us said there was a flock of them, but we only saw four. But today, we saw at least a dozen. They were loud and we heard them first. We were going outside for our walk and they flew across the roof of the motorhome to the site next to ours and landed in the grass. There were lots of acorns and they chowed down. They are beautiful. They are brilliant green with gray faces. We had an appointment today with an interventional cardiologist. He was very nice and gave us some very good information. Both he and his associate are very pleased with Terry's overall health and the performance of his heart and his new ICD (pacemaker/defibrillator). We have one more appointment tomorrow. The weather is decent here. It is a little cool, but it was 58* when I got up this morning. It got up to 67* today, which is very do-able. It was great for getting out and walking which we did just before supper. We spent Christmas with Mom and Dad. We opened our presents early. I still get excited even though I knew most of what I was getting! Terry got me a Kindle, so I played with it and got it registered and downloaded some free books. He also got me a gift card, so I will be able to use that to get some books. I think I will really like it. I had gotten him a netbook and he already had it because we took it to Indiana when we flew back for the wedding. I did put our tree up even though my decorations were just up for two days. I had two of my manger scenes out. I collect small manger scenes that I can easily fit and store in the motorhome. One such scene is a nightlight and it is very pretty. I got a new one this year which says "Peace" and it has a blue light that shines. I am including two pictures so you can see what it looks like. I like the manger scenes because they are a continual reminder of the "reason for the season." We have been working at putting things away in Texas because we needed to get back up to Houston for some doctor appointments starting the 28th. We left this morning and drove straight up here to the RV Resort. We will be here for at least a month and probably longer. The weather here isn't as warm as in the valley, but it is still warm for winter, so we should be able to stay quite comfortable. If we get a break, we may run back down to the valley, but we shall see. I'm hoping some of our friends will stop as they pass through going one direction or another. A Wedding in the Family! Last Tuesday, the 14th of December, we flew to Indianapolis from McAllen. On Wednesday we checked in with Terry's cardiologists in Indy, then drove on up to Goshen. We stayed at the storage condo for a couple nights and checked in with our manager, then went on to La Porte. That is where we attended the wedding of our nephew, Brad and his bride Nicole. La Porte made the national news just a few days before with record snowfall that resulted in 80 travelers being marooned on SR 2 due to the blowing and drifting snow, aka, blizzard conditions. Fortunately when we arrived there on Friday, the roads were clear and the entire time we were in Indiana the roads were clear. Thank goodness for that. At the hotel we caught up with Mom and Dad and as the afternoon rolled on, other friends and relatives arrived. It sure was great to see them all and to get to visit with them. This picture is my sister and I and Mom and Dad. Brandon and Megan arrived with another wedding party attendant. Their wedding will probably be in September, but nothing definite has been set. We all kept our room doors ajar so we could run between them and visit. We attended the rehearsal and dinner afterwards and enjoyed the buffet that was laid out for us. Saturday was the wedding at 4:30, so we had the day to get ready. Nita did a lot of running around and was her “super” self at getting everyone taken care of. The biggest malfunction occurred when son Brandon put on his suit jacket for the wedding. He was one of the groomsmen and, wouldn't you know, the store failed to remove the security tag. You know, those big white clunkers that spray ink everywhere if you try to remove it! Grrrr. He had exchanged the jacket for a smaller one just the week before and the clerk had put it in the bag and tied it all up for Brandon. Nothing happened as he went out the store and he was none the wiser. So, what's a person to do? We searched the internet on how to remove one safely, but no one had a Dremel tool in their suitcase. The desk clerk called a tux shop in town, but they didn't have the tool. She called the manager at Wally World and they said they would remove it, but Brandon and the guys didn't think they had time to go there. So the desk clerk found a piece of black cloth and I used safety pins to cover it. Luckily the venue was dark and I don't think one person even noticed. Brad, the groom, thought it was funny. At least with the dark colored suits, it was not noticeable in any of the pictures. Hah. The wedding was a great time. We got to sit at a table with my nieces and their husbands, Staci and Kevin and Michelle and Rod. It was great to visit with them. We don't get to see them enough when we are in the area, so it was good to catch up with them and their families. Sunday after the wedding, we drove back to the Indy airport with Brandon and Megan. We had a room for the night, but they had to catch an evening flight back to Orlando. So we found a Japanese steakhouse for supper. Megan ordered the sushi and it turns out she was the only smart one in the group. The rest of us ended up with food poisoning. It started to hit us about the same time, 7:30 p.m. Monday night. Brandon is pretty much back to normal now as is Terry, but for some reason, it is lingering with me. The food actually was good and nothing tasted suspicious. Terry said there may have been something on the grill or in the oil/seasonings they used, because we were sick, sick, sick. Fortunately it waited until we were well back to Texas and back home before it hit. Mom and Dad arrived late yesterday afternoon. They love the new tile in their place. It does look good and they are very pleased with the way it turned out. We are glad they like it. We got them all unpacked. Mom had an unfortunate mishap and scraped her arm up pretty good. Her skin on her arms is very thin and it just peeled back. We dressed it, but I was glad this morning when she thought she should have the doctor look at it. The doctor cleaned it and gave them instructions for cleaning it daily and then said the dressing they were using was good. So she feels better. We all went to the hall tonight to eat “breakfast.” Since Christmas and New Year's are both on Saturday, the hall will not be putting on breakfasts on those days. Since the meals are fund raisers for the park, they decided to have them another time so people could still come and enjoy. I couldn't eat very much, but I was able to eat a little. Everybody is glad to see Mom and Dad finally. We will be here through the weekend, then Monday we have to go back to Houston. Don't know how long we will be there, but it may be a long haul. Terry here ... shivering in the great frozen north. Flew in to Indy yesterday from the 72 degree weather of Mission, Texas. We awakened this morning to 3 degrees ..... at least it's on the plus side. Weatherman in Indy reports -4 where we lived for 33 years, 60 miles away. Today we visit my doctors at IU then we're off to Northern Indiana for nephew Brad's wedding in La Porte Saturday. Does La Porte sound familar? La Porte was a headliner on the Weather Channel this past weekend when about 80 cars were stranded due to the snow drifts on IN-2. Now does this sound like fun for a couple who follow the sun??? Just wait until the Florida family connection arrives. We will have a regular b****-fest!!! The good news is when we arrived at the Enterprise office at the airport, there were no "full size" cars ready to be rented. So we opted for the upgrade to a Jeep Compass rather than wait for 15-20 minutes. Even better news to us warm blooded creatures is that the heater works great! Well Dale's about ready, so we're off to breakfast here at the Wingate Airport Hotel. 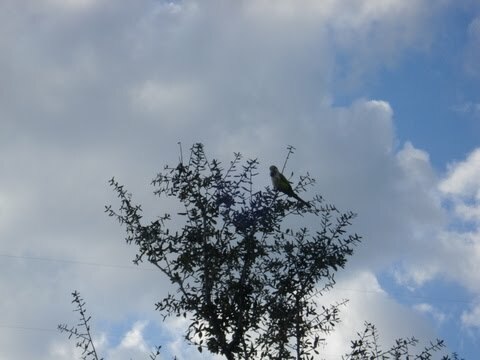 The other day, I saw two parrots fly out from beside our coach to a tree across the street. I didn't see them again until yesterday. Terry was the first to see them picking up acorns on the ground next to the motorhome and flying up into the small tree to eat them. There were beautiful. They were green with heads more of a yellow color and long slender tails. Such a lovely site. When we went outside, they retreated to the tree behind our campsite. We did see another doctor on Friday. This appointment was much different than the first and this doctor and his physician's assistant took a lot more time to talk to us about treatments and procedures. Jim, my cousin, went with us to this appointment and helped to ensure all our questions were answered and any other needed information was reviewed. We will be returning to Houston probably after Christmas for some followup. We did manage to get out and do a little Christmas shopping. We went down to Pearland which is south and surprisingly not very crowded. On our way we passed by the Reliant Stadium with its retractable roof. It is so very large. We see it everytime we go downtown. It actually is very close to our campground. 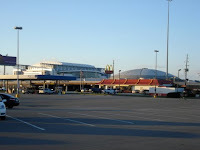 That dome that is dwarfed right next to it is the original Houston Astrodome. Remember how that was always such a big deal? It was huge, etc. 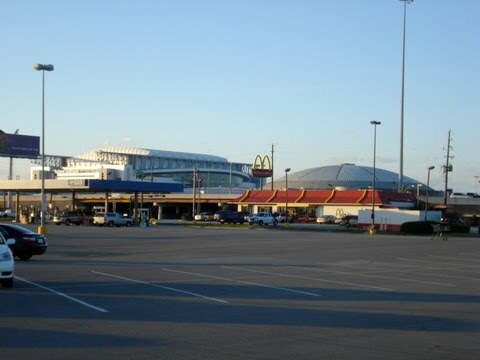 Now it is so small next to Reliant Stadium and is used very little. Cousin Jim said its future is a frequent topic of discussion in Houston. We are headed back to the valley. We came down to Aransas Pass, Texas, because our good friends, Wes and Jan are here for the winter. We caught up with them after we arrived and we all went out to dinner. What a great time. We went to "Fins" over "on the island." We had to take the ferry over there. What a trip! The dolphins were playing out in the water around the ferry. The ferry crosses the intercoastal waterway and we saw a few ships pass through. We could see them while we sat in the restaurant eating. After eating, Wes drove us out to the jetty and we got to look at the water, beaches, etc. What a neat place. It was chilly, just in the 50's, so we didn't get out. We did see some strange activity, however. Guys were out on some kind of longboard, but instead of paddling normally, they were standing upright on their boards and using a long pole with a paddle end. They were standing and actually propelling themselves out from the shore over the waves and eventually riding the wave back in. I have never seen surfboards used like this before. After riding the ferry back, we invited Wes and Jan in to visit. What a great afternoon we had with these wonderful friends. Our fulltiming friends are very special to us. We always try to hook up with them if we are anywhere close by or traveling close to any of them. They have become like family to us and we love them all dearly. Tomorrow we head on into Mission and back to our lot where the weatherman has promised a better week ahead weatherwise. I'm holding him to that! Yesterday I called my cousin Jim who lives here in Houston with his wife Lillian. They have lived here for years and the last that I spoke with him was when he intervened when my Dad needed carotid artery surgery and no one in Indiana would do it. Jim and Lillian both have advanced degrees in nursing and while Lillian is now retired, Jim still works at the University of Houston, Texas Medical Center. We arrived at their house, just about two miles from our campground, around 4 and enjoyed a lot of conversation before dinner. They prepared a wonderful dinner for us of salad, sockeye salmon, chicken breasts, wild rice and mushrooms and asparagus. We had mango sorbet and scones for dessert along with Lindor truffles and wine. What a great meal and a great time. We are waiting to hear when Terry's next appointment will be. He is being referred once again and we are hoping it will be sometime this week. We extended here at the campground for another week, so we shall see. Great Friends. . . Great Stop! We had thought we might leave the Valley on Friday, but as can happen in the Valley, we had strong winds for about three days. The plan was to head up toward Aransas Pass where some friends were staying, but the wind was following that route, so we decided to delay our departure a day and get some other things done before we left. Saturday was a great travel day and we found other friends were staying in Victoria, so we decided a stop there would break up the trip to Houston and allow us time to meet with Bob and Betsy. They were between assignments, but got a call while we were on our way there. They ended up leaving the camp the same time we did on Sunday morning. They are "gate keepers" on a large ranch. There may be several oil wells on the property and the gates allowing access must be manned to make sure everyone coming in has business there. Some gates are open only during the day, but this gate where Bob and Betsy are going is to be open 24/7 for a period of time. It is a new site and they are bringing in the rig today. That would be something to see! All of their needs are provided for. . . they are kept stocked with fresh water, a large generator to supply power, LP for their motorhome and they are pumped out whenever necessary. It was great visiting with them and sharing a couple meals before we all had to move on. They have bought a place in Meridian, Idaho, and we hope to visit them there some day. 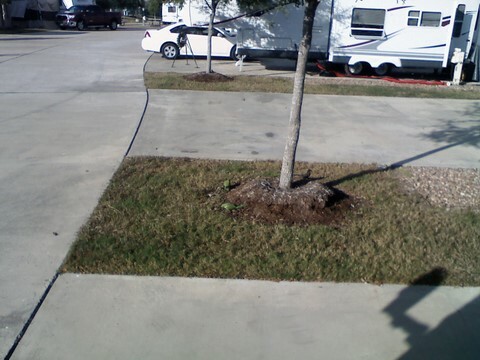 Yesterday we had an easy drive up to Houston and to the LakeView RV Resort. This is a beautiful park and we are very comfortable here. It is expensive, but much cheaper than a Houston hotel room, that's for sure. And they have weekly and monthly rates as well. Our plan is to be here for about a week and then head back to the Valley. From there we will fly back to Indiana for our nephew's wedding. We were here a few weeks ago on our way down to the Valley, so I have included a picture from that visit. John finished the tile in Mom and Dad's place on Wednesday before Thanksgiving. What a great job he did. It is beautiful. When Mom and Dad bought this park model, it was said to have new carpet in it; but for some reason, walking on it would cause black smudges to appear. I thought it had mold under it, but it didn't. When we took it up, it appeared to be clean underneath as was the underlayment. It's a mystery as to what was making the black marks. At any rate, they decided last year they would like to have tile put in. Since they are not arriving in the valley until after the big family wedding event in December, it was a good time for the tile work to be done. We had the same man who built our shed last spring do the tile work. He is meticulous and did a very good job. I think Mom and Dad will be pleased. We had Thanksgiving dinner at the hall in our park. They place was full and there was lots of food to eat. Terry and I are on very strict diets due to his bout of heart failure this summer. We do not eat any salt. It is challenging to eat anywhere other than home, but on this day, we celebrated the holiday with friends and tried to choose foods that were not likely to have salt added. It is too hard to do that when you eat out in restaurants, but if we know we are going to eat somewhere, we will try to eat lighter before we go out. The day after Thanksgiving used to be a big shopping day for us. Long before this was known as "Black Friday," we would bring our small children to grandma's house and she would babysit so Terry and I could shop. We usually made a list of what we wanted to buy and get it mostly done on that one day. My how times have changed. We no longer shop on Black Friday. I have completed most of my shopping and it was done on line. No standing in lines for me! We used Friday to gather up everything we had taken out of the motorhome as we were headed to Houston on Saturday for Terry to see a specialist on Monday. We got stuff picked up and I also was able to get Mom and Dad's house pretty much back in order. I got the floor mopped. The tile grout leaves residue that has to be wiped up and the first day you can only use a dry mop. So I put my knee pads on the next day and used a wet rag on it. It really shines now. And it was quite easy to do because there was very little furniture to work around. Now everything is back in place and it looks very nice. I didn't put their large rugs down yet, but will do that when I get back down there, hopefully in another week. On the move. . .
We are moving up to Houston today. We left the valley yesterday and stopped in at the Gateway to the Gulf RV Park in Victoria, Texas, primarily because we have friends here and it was halfway to Houston. I will blog more today once we get to Houston. It has been beautiful weather since we have been down here in the Rio Grande Valley. We walk every morning and ride bikes every afternoon. Every other day or so we go to the pool in the evening and spend some time in the hot tub. I am still not over my sinus infection, but I am making progress. The cough is pretty much gone and I no longer go through a box of kleenex during the day. One ear is still closed up and that is annoying. I still have sinus pressure on that side. I am dog sitting today. John, who is doing the new tile in Mom and Dad's park model, brought over his little mini-pin, Rainbow. Helen, John's wife, had a craft class this morning. When they were over working on Saturday I said they should bring the dog so she wouldn't have to spend the day all cooped up in their motorhome. So they brought her today and I am doggy-sitting. She is quite sweet, a little timid, but not hard to care for. She really likes Terry and wants on his lap all the time. We took her on our walk this morning and she walks really well. We are going to have Thanksgiving dinner over at the hall on Thursday. We already have our ingredients for cranberry salad and pecan pie. It will be strange not having Mom and Dad there. They are waiting until after my nephew's wedding in December to come down. We are flying back up there. I told Terry we wasted money on our doctor's appointments last month. We could have just waited for these new screening procedures and let the TSA do our physicals for us. Har har. I am trying hard to get over this sinus infection, but it is taking longer than I want. I certainly haven't felt like doing much since we arrived here at our lot in Mission. I have puttered around the coach, but haven't put out any of my "bling." The first thing I would like to do is pull all the dead weeds out in the "desertscape." Last year we had a large canopy put up over the motorhome. Am I ever glad we have it. It keeps the hot sun off of us and allows us to sit outside out of the hot sun and dry if it happens to rain. We did make a trip out to visit the big box stores looking for patio furniture. I really miss having a Menard's down here. They have the neatest furniture, but it is much too bulky to drag down here in the motorhome. Last year when we started looking after Christmas it seemed it was all picked over, so I thought I would go early this year. I found NONE. . . well maybe a chair here, a table there, but nothing I was interested in. And in the stores where they would normally display that seasonal stuff, I found Christmas decorations. So perhaps after Christmas, they will restock with spring merchandise and I will be able to find something I like. The weather has been great since we've been here. We've had warm daytime temps and cool evenings. We have been walking every morning and riding bikes every evening. A couple nights we have been over to the pool and sat in the hot tub a bit. I am still trying to stay away from people in closed areas because I do have a pretty harsh cough. I certainly am ready for this to go away so I can get out and socialize a bit. On a positive note, the road construction on the expressway in front of our park is finished and the bridge over Abrams road is done as well. That was a several years long project that made for a lot of dust and mud in the park. So glad that is finished and looking good! We arrived at our lot in Mission Texas yesterday about 5pm, for a 2 week stay. The drive over from Florida was split up into several segments. We stopped off for 3 days at my cousin Gary and Jo's place outside of Zachary LA, for some family time. Friday we headed west to Houston for a night, before the final leg to Mission yesterday. Everything at our lot was as we left it except for one of Dale's cacti cuttings bit the dust..kinda yellow instead of green. We think it might of been hit by weed killer applied during our time away. We just might have to visit Roger and Alicia's for another cutting. The other cutting from the same cactus that Dale had in a pot over the summer, survived quite well. The temp made it to 74 today, which is a great way to start the winter. I unloaded a lot of stuff from the basement of the motorhome and from the bed of the Sport Trac into the the storage shed, then we watched and slept through most of the NASCAR race. Dale has been under the weather for the past few days with a bad sinus infection, hopefully she starts getting relief soon. Every day we were in Florida, we tried to do something different. Both Brandon and Megan had to work, so we kept busy. Early in our stay, we gathered wedding packets for the kids to look at. They haven't a date yet, but they are thinking September next year. They have to check with a couple venues to see if the date they want is available. I wish we could have stayed and helped with some stuff, but they will get it done. The big thing is getting a date, then they can start contacting vendors. We continue to walk on the beach every morning. One day we saw this little guy. He is a ghost crab and he certainly didn't want to see us nor let us get close. He was quite comical because when the water would come up and cover him, you could only see his eyes sticking up. Really odd little creatures. One day we drove up to Cocoa Beach. We actually have been there a couple times since we got here, but this time we went to a swimsuit shop. I have not had any luck finding a swimsuit, and I found an ad for a shop up there. Luck was with me because I found two swimsuits that fit me and that I liked. Terry spent the time reading. Another day we went down to Sebastian Inlet State Park. This park I have posted about before and I have posted pictures as well, but it is a beautiful spot. The fishing must have been good because the jetty pier was filled with fishermen. We watched as one man landed a yellow tail and another brought a ray up on the deck. The ray, while rather small, had a very long tail with a very long barb on the end. The fisherman was apparently familiar with these interesting creatures. He retrieved pliers out of his tackle box and stepped on the tail while he tried to remove the hook from the ray. Unfortunately, the hook was too deep, so the line was cut. The little ray really knew how to whip that tail, so the man gently pushed him over the side of the pier and he splashed into the water to swim another day. As you know, the shuttle has been delayed until Monday, this time due to a fuel leak. Since we wanted to get to Texas and get some things done at our lot there, we decided we weren't going to wait any longer. If it doesn't fly Monday, it will be another month before there is another window and they weren't that confident Monday was going to work. We decided to hit the road. We got a late start, so it was 5 o'clock before we got to our campground. That is late for us. We are in a very nice camp next to a new convenience store where we were able to fuel the motorhome. That gal running the store is a real hoot. While I was in there paying for fuel, she yelled at one of the other employees and said, "I hear Gary is stealing corn again. . . looks like I'm gonna' have to get my gun and shoot somebody." Hahaha. The rules for the campground tell campers that they are to clean "game" in the designated areas only and not to dump the entrails and carcasses in the dumpster but carry it back to the woods and bury it. This should be an interesting night. Our countdown is a go!!!!! Cancelled the shuttle Discovery's last launch again, 4th time this week. Earliest date now is this Monday soooo.......We're off to trek along the Florida pan-handle toward the Escapees Park near our Monday mail drop in Summerdale, Alabama. Hope to see cousins Gary & Jo north of Baton Rouge on our way to Mission in next couple of weeks. Dale booked our tickets to the frozen north (Indiana) for nephew Brad and Nicole's December wedding last night. Will arrive in Indy the 14th for my Wednesday doctor's appointments, then she drives us north to La Porte for the wedding that weekend. Then Monday the 20th it's back to sunny Mission, Texas. Terry subbing for Dale, who is locking down the inside of Phaeton Place for travel. First off, I just never get tired of these sunrises. We have been getting out and walking on the beach every morning and time it to coincide with the sunrise which is about 7:32. It gets us out exercising early while it is breezy and cool and is a change of scenery from walking in the park. Yesterday we went to Cocoa with Brandon and Megan and took an airboat ride through the St. John's River basin. We were able to see several alligators and got fairly close to one who was sunning himself on the bank. He was missing a front paw so maybe that's why he wasn't so interested in moving, but we didn't harrass him either. When he started stirring, we left. Ho ho. We saw several others in the water and a couple on the banks and enjoyed our ride. There are cattle that graze along the river's edge and the alligators don't bother them. The alligators won't bother anything larger than they are. Snakes, however, are more of a danger to the cattle.